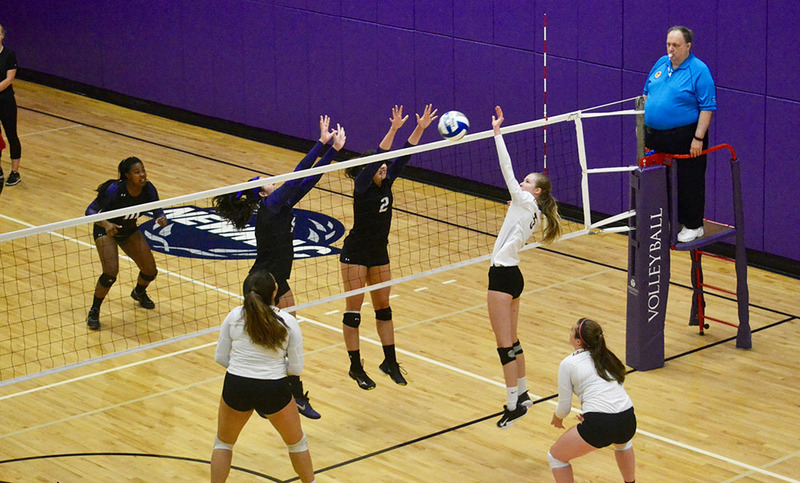 Emerson's women's volleyball team fell one win short of the postseason. The Emerson women’s volleyball team went into its final match against Springfield in a win-or-go-home situation, needing a victory to make the NEWMAC playoffs. The day ended in disappointment for the Lions as they fell 3-1. The Lions went 13-14 on the season with a conference record of 3-7. They finished 8th in the NEWMAC. Even though Emerson finished under .500 and missed the playoffs, head coach Ben Read was happy with the way the season went and the way his group performed. Read also highlighted some impressive performances from their losses. Two matches that stood out to him were defeats against Wellesley and Coast Guard, which both ended with a score of 3-2. He said those games stood out because Wellesley is a strong team that finished the year 8-2 and lost to MIT in the NEWMAC championship. Read was proud of the team’s performance against Coast Guard, as it was an away game and Emerson had never taken Coast Guard to five sets before. “We’re really close to being right where we need to be which is very exciting to see,” Read said. One aspect that defined the women’s volleyball team’s season was roster size. The Lions only had nine players, as opposed to last year when they had 17. Read said the large personnel loss was due to an injury to now team manager, senior Elaine Nichols, players quitting for personal reasons, recruits going elsewhere for financial reasons, and the fact they graduated six seniors. Freshman outside hitter Grace Tepper said the small squad size affected their play. While having a small squad negatively affected Emerson’s ability to practice and play in games, especially when players went down with injury, the team also viewed its size as a positive. Senior middle hitter Halley Dewey said the size brought them closer together despite the struggles. Read praised the team's work ethic despite its small roster. Tepper was one of the Lions’ standout players in her first season. She led the team with 267 kills, also good for 12th in the NEWMAC. She was also second in digs with 219 despite missing four matches with an ankle injury. Read was pleased with Tepper’s performance in her first year. Read also praised the team’s other freshman, Albany Alexander, a right side hitter who was fourth on team in kills with 146. Alexander was forced to take on a back row role, which is something she had not done a lot in past, but her dedication impressed Read. Dewey sees Tepper and Alexander being key figures going forward. The squad has a young core, and will only graduate one senior this year in Dewey. The prospect of keeping the already close knit squad together for next season is exciting for Tepper.